An in-depth report on the causes, diagnosis, treatment, and prevention of pneumonia. Pneumonia is inflammation of the air sacs in the lungs that is most often caused by infection with bacteria, viruses, or other organisms. Occasionally, inhaled chemicals other non-infectious factors can cause lung inflammation (pneumonitis). Age groups at the extremes, that is the very young and old, are more vulnerable to pneumonia. Healthy adults can usually fight off pneumonia caused by infections. However, it is easier for bacteria to grow in the lungs of people who are sick and have a weakened immune system, like those who are recovering from influenza (the flu) or an upper respiratory illness. Pneumonia is the 6th leading cause of death for Americans age 65 years and older. Worldwide, pneumonia (with a bacterial origin) is a leading cause of death in children under age 5 years. When air is inhaled through the nose or mouth, it travels down the trachea to the left bronchus and right bronchus, where it first enters the lungs. From the bronchus, air goes through the smaller bronchi, into the even smaller bronchioles, and lastly into the alveoli. Lobar pneumonia occurs in one part, or lobe, of the lung. Bronchopneumonia tends to be scattered throughout the lung. Health care providers often classify pneumonia based on where the disease is contracted. This helps predict which organisms are most likely responsible for the illness and, therefore, which treatment is most likely to be effective. People with this type of pneumonia contracted the infection outside of a hospital setting. It is one of the most common infectious diseases. It often follows a viral respiratory infection, such as the flu. One of the most common causes of bacterial CAP is Streptococcus (S) pneumoniae. Other causes include Haemophilus (H) influenzae, Mycoplasma pneumoniae, and Chlamydia pneumoniae (not to be confused with a different chlamydia that is sexually transmitted). Hospital-Acquired Pneumonia. Hospital-acquired pneumonia is an infection of the lungs contracted during a hospital stay. This type of pneumonia tends to be more serious because patients in the hospital already have weakened defense mechanisms, and the infecting organisms are usually more dangerous than those encountered in the community. Hospital patients are particularly vulnerable to Gram-negative bacteria, which are resistant to many antibiotics, and staphylococci. Hospital-acquired pneumonia is also called nosocomial pneumonia. Ventilator-associated pneumonia (VAP). A subgroup of hospital-acquired pneumonia is VAP, a very serious infection contracted by patients on ventilators in hospitals and long-term nursing facilities. Nursing-home acquired pneumonia. Pneumonia acquired in a nursing home or other long-term care facility is the second most common type of infection in these facilities, and it is usually bacterial. This type of pneumonia is sometimes difficult to diagnose as older populations are less likely to report fever, chills, and chest pain. Chest radiography and physical exam are necessary. Sputum sample and antigen tests may be helpful. In most cases, a person breathes in the infectious organism, which then travels through the airways to the lungs. Sometimes, the normally harmless bacteria in the mouth, or on items placed in the mouth or swallowed, can enter the lungs. This usually happens if the body's "gag reflex," an extreme throat contraction that keeps substances out of the lungs, is not working properly. Infections can spread through the bloodstream from other organs to the lungs. However, in normal situations, the airways protect the lungs from substances that can cause infection. The nose filters out large particles. If smaller particles pass through, nerves along the airway prompt a cough or sneeze. This forces many particles back out of the body. Tiny particles that reach the small tubes in the lungs (bronchioles) are trapped in a thick, sticky substance called mucus. The mucus and particles are pushed up and out of the lungs by tiny hair-like cells called cilia, which beat like a drum. This action is called the "mucociliary escalator." If bacteria or other infectious organisms manage to avoid the airway's defenses, the body's immune system attacks them. Large white blood cells called macrophages destroy the foreign particles. The above-mentioned defense systems normally keep the lungs healthy. If these defenses are weakened or damaged, however, bacteria, viruses, fungi, and parasites can easily infect the lungs, producing pneumonia. The lungs are 2 spongy organs in the chest surrounded by a thin, moist membrane called the pleura. Each lung is composed of smooth, shiny lobes. The right lung has 3 lobes, and the left has 2. About 90% of the lung is filled with air. Only 10% is solid tissue. 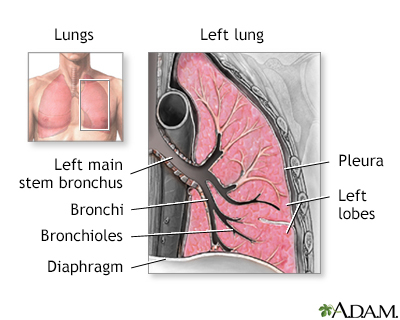 There are several parts to each lung. When a person takes a breath (inhales), air travels from the windpipe (trachea) into the lung through the main (primary) right and left bronchi, which branch into smaller tubes called secondary bronchi. Each alveolus has a thin membrane that allows oxygen and carbon dioxide to pass in and out of the capillaries, the smallest of the blood vessels, which surround the alveolus. When you take a deep breath, the membrane unfolds and expands. Fresh oxygen moves into the blood stream in the capillaries, and carbon dioxide passes from the capillaries into the air in the alveoli, where it is carried out of the body through the lungs. Blood vessels carry the oxygen-rich blood to the heart, where it is pumped throughout the body. Bacteria are the most common causes of pneumonia. However, pneumonia can also be caused by viruses, fungi, and other agents. It is often impossible to identify the specific culprit. Many bacteria are grouped into 1 of 2 large categories by a laboratory procedure known as Gram staining. Bacteria are stained with special dyes and then washed in a special solution. The color of the bacteria after washing determines whether they are Gram-negative or Gram-positive. Knowing which group the bacteria belong to helps determine the severity of the disease, and how to treat it. Different bacteria are treated with different drugs. S pneumoniae (also called pneumococcus) is the most common cause of pneumonia. Staphylococcus (S) aureus, the other major Gram-positive bacterium responsible for pneumonia, is the organism most often associated with viral influenza. It can develop about 5 days after the start of flu symptoms. Pneumonia from S aureus most often occurs in people with weakened immune systems, very young children, hospitalized patients, and drug abusers who use needles. It is uncommon in healthy adults. Other Gram-positive bacteria that can sometimes cause pneumonia include Streptococcus pyrogenes (group A streptococcus), and anaerobic streptococci. These bacteria stain pink. Gram-negative bacteria commonly cause infections in hospitalized or nursing home patients, children with cystic fibrosis, and people with long-term (chronic) lung conditions. Klebsiella (K) pneumoniae may be responsible for pneumonia in alcoholics and other people who are physically debilitated. It is also associated with recent use of very strong antibiotics. Pseudomonas (P) aeruginosa is a major cause of hospital-acquired pneumonia (nosocomial pneumonia). It is a common cause of pneumonia in people with chronic or severe lung disease. Moraxella (M) catarrhalis is found in everyone's nose and mouth. Experts have identified this bacterium as an uncommon cause of certain pneumonias, particularly in people with lung problems such as asthma or emphysema. Other Gram-negative bacteria that cause pneumonia include E coli, Proteus mirabilis (found in damaged lung tissue), enterobacter, Neisseria (N) meningitidis, and acinetobacter. Mycoplasma pneumoniae, the most common atypical pneumonia organism. Mycoplasma is a very small bacterium that lacks a cell wall. Pneumonia caused by mycoplasma spreads when someone carrying the infection comes in close contact with others for a long period of time. It is most often found in school-aged children and young adults. The condition, commonly called "walking pneumonia," is usually mild and seen in the outpatient setting. Chlamydia pneumoniae is now thought to cause 10% of all CAP cases. This atypical pneumonia is most common in young adults and children, and is usually mild. It is less common, but usually more severe, in older people. Legionella pneumophila causes Legionnaires disease, a severe illness. It is contracted by breathing in drops of contaminated water. Outbreaks are often reported in hotels, office buildings, and on cruise ships, where people are exposed to contaminated droplets from cooling towers and evaporative condensers. Outbreaks have also been reported in people who have been near whirlpools and saunas. Legionella pneumophila is not passed from person to person. The influenza virus is the most important cause of viral pneumonia. In some cases, bacterial pneumonia can also develop as a complication of influenza. Both types of influenza-related pneumonias can be very serious, particularly for older people and people with heart disease. It can develop about 5 days after flu symptoms start. Although ordinary flu viruses are the major culprits in the US, avian (bird) flu is a worry for the future (see below). Respiratory syncytial virus (RSV). Most infants are infected with RSV at some point, but it is most often mild. However, RSV is a major cause of pneumonia in infants, as well as in adults with damaged immune systems. Human parainfluenza virus. This virus is a leading cause of pneumonia and bronchitis in children, older people, and people with damaged immune systems. Adenoviruses. Adenoviruses are common and usually are not problematic, although they have been linked to about 10% of childhood pneumonias. Adenovirus 14 has been linked to an outbreak of severe CAP in the Pacific Northwest as well as military recruits. Herpes viruses. In adults, herpes simplex virus and varicella zoster (the cause of chicken pox) can cause pneumonia in people with impaired immune systems. Severe acute respiratory syndrome (SARS). SARS is a respiratory infection caused by a coronavirus, which appears to have jumped from animals to humans. The disease was first reported in China in 2003. Rhinoviruses. These viruses often cause the common cold and have been associated with community acquired pneumonia. Human metapneumovirus (HMPV) was discovered in the Netherlands in 2001. It has been linked with pneumonia most commonly in young children and older adults. "Bird flu" (type A influenza subtype H5N1) is spreading around the globe. Fortunately, only a few hundred human cases have been identified. Most have resulted from close contact with infected birds. The virus does not seem to spread easily from person to person. All people diagnosed with "bird flu" show signs of pneumonia, although symptoms may be mild. Oseltamivir (Tamiflu) is the most effective treatment for this type of influenza, which can be fatal. A newer strain of avian influenza, H7N9, has been reported in humans in China as of 2013. This new "bird flu" strain causes severe pneumonia and has a high mortality rate, though to date the virus is not transmitted from human to human. A new cause of severe pneumonia was first reported in Saudi Arabia in September 2012. Within a year, 58 cases, including 33 deaths, were reported in Jordan, Qatar, Saudi Arabia, the United Arab Emirates (UAE), France, Germany, Italy, Tunisia, and the United Kingdom. Since 2012 there has been over 1730 cases. The World Health Organization warns this new viral illness could become a pandemic. However, person-to-person transmission has been limited to close contacts. In the United States, no cases of MERS have been reported since 2014. The mouth contains a mixture of bacteria that is normally harmless. However, if this mixture reaches the lungs, it can cause a serious condition called aspiration pneumonia. This may happen after a head injury or general anesthesia, or when a person takes drugs or alcohol. In such cases, the gag reflex does not work as well as it should, so bacteria can enter the airways. Unlike other organisms are inhaled, some of the bacteria that cause aspiration pneumonia do not need oxygen to live. These bacteria are called anaerobic bacteria. Pneumocystis (P) jiroveci (formerly called Pneumocystis carinii) an atypical organism. Originally thought to be protozoa, it is now classified as a fungus. P jiroveci is usually harmless in people with healthy immune systems. It is the most common cause of opportunistic pneumonia in AIDS patients. Certain viruses, such as cytomegalovirus (CMV). Fungi, such as Candida albicans. In addition to AIDS, other conditions put people at risk for opportunistic pneumonia. They include cancers, such as lymphoma and leukemia. Long-term use of corticosteroids and drugs known as immunosuppressants also increases the risk for these pneumonias. Mycobacterium tuberculosis is the microorganism responsible for causing tuberculosis (TB), a long-term (chronic) granulomatous disease primarily involving the lung. Although not common in the United States, TB affects almost a quarter of the world population and is one of the top 10 causes of mortality globally. TB is usually a chronic lung condition, but can sometimes manifest as pneumonia, particularly in immunocompromised people, and must be distinguished from it in the diagnosis process. Exposure to chemicals can also cause inflammation and pneumonia. Where you work and live can put you at higher risk for exposure to pneumonia-causing organisms. Workers exposed to cattle, pigs, sheep, and horses are at risk for pneumonia caused by anthrax, brucella, and Coxiella burnetii (which causes Q fever). Inhalation or respiratory anthrax is a life-threatening infectious disease caused by inhaling the spores of the bacterium Bacillus anthracis. Although the spores are dormant when breathed in, they germinate when exposed to a warm, moist environment, such as the lungs. Not all particles are small enough to pass into the alveoli, or air sacs, but those that do begin to multiply and may spread to the lymphatic system. When the spores germinate, several toxins are released. Particles illustrated are not to scale. Agricultural and construction workers in the Southwest are at risk for coccidioidomycosis (Valley fever). The disease is caused by the spores of the fungi Coccidioides immitis and Coccidiodes posadasii. Those working in Ohio and the Mississippi Valley are at risk for histoplasmosis, a lung disease caused by the fungus Histoplasma capsulatum. This fungus grows well in areas enriched with bird or bat droppings. Workers exposed to pigeons, parrots, parakeets, and turkeys are at risk for psittacosis, a lung disease caused by the bacteria Chlamydia psittaci. Hantavirus, a rare virus carried by rodents, causes a dangerous form of lung disease. It does not spread from person to person. Cases have occurred in over 30 states. Common symptoms in infants include fever, rapid breathing, nasal flaring, and low oxygen saturation. Children ages 2 to 4 years with pneumonia usually present with a cough plus one or more lower respiratory tract infection symptoms, such as fever, rapid breathing and low oxygen levels. It is important to note that older people may have fewer or different symptoms than younger people. Symptoms may be subtle or non-specific. Some older people may be confused, lethargic, and show general deterioration. Atypical pneumonia is most commonly caused by mycoplasma, chlamydia, or a virus. It usually appears in children and young adults. Symptoms are usually mild and often go undiagnosed and untreated. Legionnaire disease, however, is a severe form of atypical pneumonia that usually strikes adults and seniors. General flu-like symptoms often occur first. They may include fatigue, fever, weakness, headache, nasal discharge, sore throat, earache, and stomach and intestinal distress. Vague pain under and around the breastbone may occur, but the severe chest pain associated with typical bacterial pneumonia is uncommon. People may have a severe hacking cough, but it usually does not produce sputum. Between 5 and 10 million people get pneumonia in the United States each year. More than 1 million people are hospitalized due to the condition. In 2015, pneumonia was the 5th most common cause of hospitalization in the US. Although the majority of people with pneumonia respond well to treatment, the infection kills 40,000 to 70,000 people each year. Men with CAP tend to fare worse than women. The death rate for CAP can range from well below 5% in mildly ill outpatients to 10% to 30% in seriously ill patients who need to be admitted to a hospital. If pneumonia develops in patients already hospitalized for other conditions, or those in a nursing home, death rates can be much higher. This is true for anyone who is on a ventilator. CAP is responsible for 350,000 to 620,000 hospitalizations in older people every year. Older adults have lower survival rates than younger people. Even when older individuals recover from CAP, they have higher-than-normal death rates over the next several years. Older people who live in nursing homes or who are already sick are at particular risk. Small children who develop pneumonia and survive are at risk for developing lung problems in adulthood, including chronic obstructive pulmonary disease (COPD). People with a history of pneumonia and other respiratory illnesses in childhood are more than twice as likely to die of COPD as those without a history of childhood respiratory disease. Pneumonia poses a special hazard for pregnant women, possibly due to changes in a pregnant woman's immune system. This complication can lead to premature labor and increases the risk of death during pregnancy. Pneumonia is particularly serious in people with an impaired immune system. This is particularly true for AIDS patients. Pneumonia is also very dangerous in people with diabetes, cirrhosis, sickle cell disease, cancer, and in those whose spleen has been removed. Mycoplasma and chlamydia are the most common causes of mild pneumonias and are most likely to occur in children and young adults. These people rarely need hospitalization when they are appropriately treated, although recovery may still take time. Severe and life-threatening cases of pneumonia are more likely to occur in older people with other medical conditions. S pneumoniae is the most common cause of pneumonia, as well as of other bacterial upper respiratory infections. It can produce severe pneumonia, with mortality rates of 10%. Nevertheless, pneumococcal pneumonia responds very well to many antibiotics. Vaccination protects against several types of pneumococcal pneumonia. S aureus is a Gram-positive bacterium that often causes severe pneumonia in hospitalized and high-risk patients and following influenza A and B. People who get this form of pneumonia may develop pockets of infection in their lungs (abscesses) that are difficult to treat and can cause the death of lung tissue (necrosis). Mortality rates are 30% to 40%, in part because the people who develop this infection are generally very ill or vulnerable. P aeruginosa and K pneumoniae are Gram-negative bacteria that pose a risk for abscesses and severe lung tissue damage. Legionella pneumophila can spread easily from contaminated water droplets that enter the air. Treatments have improved dramatically since it was first identified. However, many people may experience serious problems, including coughing, shortness of breath, fatigue, and nervous system (neurological) and muscle complications. Viral pneumonia is usually very mild, but there are exceptions. The influenza virus can cause severe pneumonia; fortunately, most people with the flu do not get this complication. RSV pneumonia rarely poses a danger for healthy young adults, but it can be life threatening in infants and serious in older people. An abscess in the lung is a thick-walled, pus-filled cavity that forms when infection has destroyed lung tissue. It is more commonly seen with aspiration pneumonia, when a mixture of organisms is carried into the lung. Untreated abscesses can cause hemorrhage (bleeding) in the lung, but targeted antibiotic therapy significantly reduces the danger. Drainage with a needle may also be needed. Abscesses are more common with anaerobic bacteria, S aureus, P aeruginosa, or K pneumoniae, and are uncommon with S pneumoniae. Respiratory failure is one of the top causes of death in people with more severe pneumonia. Acute respiratory distress syndrome (ARDS) is the specific condition that occurs when the lungs are unable to function and oxygen is so severely reduced that the person's life is at risk. Failure can occur if pneumonia leads to physical changes in the lungs that make it even harder for the lungs to exchange oxygen (ventilatory failure). Bacteremia -- bacteria in the blood -- is the most common complication of pneumococcus infection, although it rarely spreads to other sites. Bacteremia is a frequent complication of infection from Gram-negative organisms, including H influenzae. The pleura is a 2-layered membrane that surrounds each lung. In some cases of pneumonia the pleura becomes inflamed, which can result in breathlessness and chest pain when breathing. In about 20% of pneumonia cases fluid builds up between the pleural membranes, a condition known as pleural effusion. Ordinarily, the narrow zone between the 2 membranes contains only a tiny amount of fluid, which lubricates the lungs. In most cases, particularly in S pneumoniae, the fluid remains sterile (no bacteria are present), but occasionally it can become infected and even filled with pus, a condition called empyema. Empyema is more likely to occur with specific organisms, such as S aureus or K pneumoniae infections. The condition can cause permanent scarring. In some cases, air may fill up the area between the pleural membranes, causing the lungs to collapse. This is called pneumothorax. It may be a complication of pneumonia (particularly S pneumoniae) or of the invasive procedures used to treat pleural effusion. Pneumothorax occurs when air leaks from inside the lung to the space between the lung and the chest wall. The lung then collapses. The dark side of the chest (right side of the picture) fills with air from outside of the lung tissue. In rare cases, infection may spread from the lungs to the heart and possibly throughout the body. This can cause abscesses in the brain and other organs. Bacterial pneumonia is linked with an increased risk of acute heart problems, such as heart attack or abnormal heart rhythm (arrhythmia). Kidney complications and electrolyte imbalances are common in people admitted to the hospital with pneumonia. If not treated, these problems cause more severe illness and increase the risk of death. Hydration through a vein (intravenous) controls the problem. Pneumonias caused by the atypical organisms mycoplasma and chlamydia are usually mild. Chlamydia pneumoniae, Mycoplasma pneumoniae, and RSV are becoming suspects in many cases of severe adult asthma. Older people and the very young. People with long-term (chronic) or severe medical conditions, such as lung problems, heart disease, nervous system (neurologic) disorders, and cancer. People who have had surgery, particularly people over age 80 years. Among the surgical procedures that pose a particular risk areremoval of the spleen (splenectomy), abdominal aortic aneurysm repair, or operations that impair coughing. People who have been in the ICU. This is particularly true for newborns or patients on breathing machines (mechanical ventilators). People who lie flat on their backs are at particular risk for aspiration pneumonia. Raising the person up may reduce this risk. People who have received sedation. Hospital patients who receive sedatives also have a higher risk of developing nosocomial pneumonia. People who received antibiotics within the previous 90 days. Hospitalized patients are particularly vulnerable to Gram-negative bacteria and staphylococci, which can be particularly dangerous in people who are already ill.
CAP is the most common type of pneumonia. It develops outside of the hospital. Each year 2 to 4 million people in the US develop CAP, and 600,000 are hospitalized. Older people, infants, and young children are at greatest risk for the disease. Chronic obstructive lung disease (COPD), which includes long-term (chronic) bronchitis and emphysema, affects 15 million people in the US. This condition is a major risk factor for pneumonia. Long-term use of corticosteroid inhalers may increase the risk of pneumonia in people with COPD. People with other types of chronic lung diseases, such as bronchiectasis and interstitial lung diseases, are also at increased risk for getting pneumonia and more likely to have complications. Bronchitis is the inflammation of the bronchi, the main air passages to the lungs. It generally follows a viral respiratory infection. Symptoms include coughing, shortness of breath, wheezing, and fatigue. People with impaired immune systems are extremely susceptible to pneumonia. It is a common problem in people with HIV and AIDS. A wide variety of organisms, including P jiroveci, myobacterium species, Histoplasma capsulatum, Coccidioides immitis, aspergillus species, cytomegalovirus, and Toxoplasma gondii, can cause pneumonia. People who are on corticosteroids or other medications that suppress the immune system (such as chemotherapy drugs) are also prone to infection. The risk is strongest when people have recently begun treatment with PPIs, and lessens over time. All of these may increase the risk of aspiration pneumonia. Recruits on military bases and college students living in dormitories are at higher-than-average risk for Mycoplasma pneumonia. These groups are at lower risk, however, for more serious types of pneumonia. The risk for pneumonia in people who smoke more than a pack a day is 3 times that of nonsmokers. Those who are chronically exposed to secondhand cigarette smoke, which can injure airways and damage the cilia, are also at risk. Quitting smoking reduces the risk of dying from pneumonia to normal, but the full benefit takes up to 10 years to be realized. Toxic fumes, industrial smoke, and other air pollutants may also damage cilia function, which is a defense against bacteria in the lungs. Alcohol or drug abuse is strongly associated with pneumonia. These substances act as sedatives and can diminish the reflexes that trigger coughing and sneezing. Alcohol also interferes with the actions of macrophages, the white blood cells that destroy bacteria and other microbes. Intravenous drug abusers are at risk for pneumonia from infections that start at the injection site and spread through the bloodstream to the lungs. Men with CAP tend to fare worse than women. Men are 30% more likely than women to die from the condition. It is important to determine whether the cause of CAP is a bacterium, atypical bacterium, or virus, because they require different treatments. In children, for example, S pneumoniae is the most common cause of pneumonia, but RSV may also cause the disease. Although symptoms may differ, they often overlap, which can make it difficult to identify the organism by symptoms alone. The cause of CAP is found in only about half of cases. Nevertheless, in many cases of mild-to-moderate CAP, the physician is able to diagnose and treat pneumonia based solely on a medical history and physical examination. Many hospitalized patients have similar symptoms, including fever or abnormal x-rays. In hospitalized patients, sputum or blood tests often show bacteria or other organisms, but such agents do not necessarily indicate pneumonia. Rales, a bubbling or crackling sound. Rales often suggest pneumonia. Rhonchi, abnormal rumblings indicating that there is sputum in the large airways. A dull thud. The physician will use a test called percussion, in which the chest is tapped lightly. A dull thud, instead of a hollow drum-like sound, indicates certain conditions that suggest pneumonia. These conditions include consolidation (in which the lung becomes filled with fluid and pus) and pleural effusion (fluid build-up in the space between the lungs and the lining around it). A pulse oximetry test can help determine if a person needs hospital care. A simple test using a device on the fingertip or earlobe, this determines the amount of oxygen in the blood. Although current antibiotics can attack a wide spectrum of organisms, it is best to use an antibiotic that targets the specific one making a person sick. Unfortunately, people carry many bacteria, and sputum and blood tests are not always effective in distinguishing between harmless and harmful kinds. The Infectious Diseases Society of America/American Thoracic Society (IDSA/ATS) recommends diagnostic testing when it may impact the choice of antibiotic and in people with a high likelihood of accurate results (sicker patients). Many of these laboratory tests take 4 to 5 days or longer to complete, however, and therapy should be started before results are available. Although viral pneumonia accounts for more than a third of CAP cases, it can sometimes be difficult to determine if the pneumonia is viral or bacterial in origin. In severe cases, a doctor needs to use invasive diagnostic measures to identify the cause of the infection. These tests are not commonly performed in outpatients. Standard lab tests are used to help diagnose pneumonia. 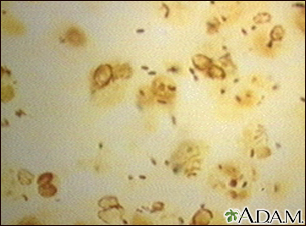 A sputum sample may reveal the organism causing the infection. The person coughs as deeply as possible to bring up mucus from the lungs, since a shallow cough produces a sample that usually only contains normal mouth bacteria. Some people may need to inhale a saline spray to produce an adequate sample. In some cases, a tube will be inserted through the nose into the lower respiratory tract to trigger a deeper cough. Blood, which suggests an infection is present. Color and consistency. If it is gray, green, or brown, an infection is likely. The sputum sample is sent to the laboratory, where it is analyzed for the presence of bacteria and to determine whether the bacteria are Gram-negative or Gram-positive. White blood cell count (WBC). High levels indicate infection. Blood cultures. Cultures are done to determine the specific organism causing the pneumonia, but they are accurate in only 10% to 30% of cases. Their use is generally limited to severe cases. Detection of antibodies. Antibodies are immune factors that target specific foreign invaders. Antibodies that react with mycoplasma or chlamydia are not present early enough in the course of pneumonia to allow for prompt diagnosis by this method. C-reactive protein or procalcitonin. Not generally recommended but may help identify which people with respiratory symptoms have pneumonia and need to be hospitalized. Procalcitonin may also help guide the clinician in the appropriate use of antibiotics. Polymerase chain reaction (PCR). In some difficult cases, PCR may be performed. The test makes multiple copies of the genetic material (DNA) of a virus or bacteria to make it detectable. PCR is useful for identifying certain atypical bacteria strains, including mycoplasma and Chlamydia pneumonia. While expensive, a real-time PCR test may help quickly diagnose Pneumocystitis pneumonia in HIV-positive patients. Urine antigen tests for Legionella pneumophila (Legionnaires disease) and S pneumoniae may be helpful in some people with severe CAP. In critically-ill people with VAP, doctors have tried sampling fluid taken from the lungs or trachea. These techniques enabled the physicians to identify the pneumonia-causing bacteria and start the appropriate antibiotics. However, this made no difference in the length of stay in the ICU or hospital, and there was no significant difference in outcome. 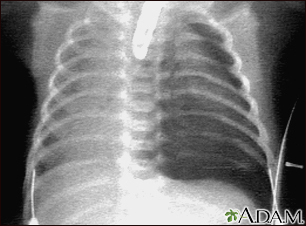 A chest x-ray is nearly always taken on a patient admitted to the hospital to confirm a pneumonia diagnosis. 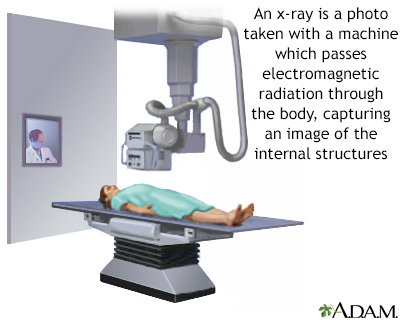 X-rays are a form of electromagnetic radiation (like light). They are of higher energy, however, and can penetrate the body to form an image on film. Structures that are dense (such as bone) will appear white, air will be black, and other structures will be shades of gray depending on density. X-rays can provide information about obstructions, tumors, and other diseases, particularly when coupled with the use of barium and air contrast within the bowel. CT and MRI can help detect tissue damage, abscesses, and enlarged lymph nodes. They can also detect some tumors that block bronchial tubes. No imaging technique can determine the actual organism causing the infection. However, features on the CT scan of people with certain forms of pneumonia -- for example that are caused by Legionella pneumophila -- are usually different from features produced by other bacteria in the lungs. If a doctor detects pleural effusion during the physical exam or from an imaging procedure, and suspects that pus (empyema) is present, a thoracentesis is performed. Fluid in the pleura is withdrawn using a long thin needle inserted between the ribs. The fluid is then sent to the lab for multiple tests. Complications of this procedure are rare, but they can include collapsed lung, bleeding, and infection. Bronchoscopy is an invasive test to examine respiratory secretions. It is not usually needed in people with CAP, but it may be appropriate for people with a severely compromised immune system who need immediate diagnosis, or in people whose condition has worsened during treatment. The physician inserts a fiber optic tube into the lower respiratory tract through the nose or mouth. The tube acts like a telescope into the body, allowing the physician to view the windpipe and major airways and look for pus, abnormal mucus, or other problems. The doctor removes specimens for analysis and can also treat the person by removing any foreign bodies or infected tissue encountered during the process. Bronchoalveolar lavage (BAL) may be done at the same time as bronchoscopy. This involves injecting high amounts of saline through the bronchoscope into the lung and then immediately sucking the fluid out. The fluid is then analyzed in the laboratory. BAL is an effective method for detecting specific infection-causing organisms. In very severe cases of pneumonia or when the diagnosis is unclear, particularly in people with a damaged immune system, a lung biopsy may be required. A lung biopsy involves taking some tissue from the lungs and examining it under a microscope. This is a very old procedure that is not done often anymore because it is invasive and poses a slight risk for collapsed lung. Some experts argue, however, that a lung tap is more accurate than other methods for identifying bacteria, and the risk it poses is slight. Given the increase in resistant bacteria, they believe its use should be reconsidered in young people. An infectious disease specialist may need to be consulted in severe or difficult cases. Other common causes of long-term (chronic) cough include heavy smoking or the use of blood pressure drugs known as ACE inhibitors. 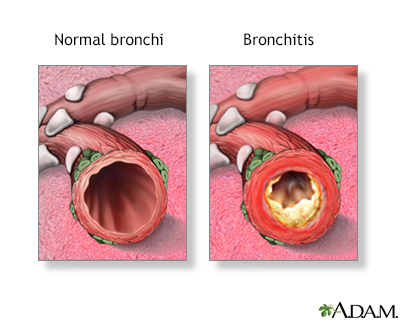 Acute bronchitis is an infection in the passages that carry air from the throat to the lung. The infection causes a cough that produces phlegm. Acute bronchitis is almost always caused by a virus and usually clears up on its own within a few days. In some cases, acute bronchitis caused by a cold can last for several weeks. People with bronchitis are more likely to have wheezing, but less likely to have chills, very high fevers, and other signs of severe illness. Those with pneumonia often cough up heavy sputum, which may contain blood. X-rays of people with pneumonia show inflammation and other changes in the lung tissue that are not seen in people with chronic bronchitis. In asthma, the cough is usually accompanied by wheezing and occurs mostly at night or during activity. Fever is rarely present (unless the person also has an infection). Asthma symptoms from occupational causes can lead to persistent coughing, which is usually worse during the workweek. Tests, like the methacholine inhalation challenge and pulmonary function studies, may be effective in diagnosing asthma. Whether people are treated at home or admitted to the hospital, receiving their first dose of antibiotics quickly improves the outcome of the illness and the speed at which they get better. Many adult people do not need to be hospitalized for pneumonia, and can be safely treated at home. Likewise, many people who are admitted to the hospital could be released sooner. Strategies are being devised to determine which people can be safely discharged and when they can be discharged. In general, low-risk people with mild-to-moderate pneumonia do just as well when treated as outpatients. They return to work and normal activities faster than those treated in the hospital. A variety of guidelines and tools have been developed to help determine who can safely be treated at home and who cannot. Commonly used tools include the Pneumonia Severity Index (PSI), British Thoracic Society Rule (BSR), and CURB-65. All of these assessment tools evaluate several risk factors. The more of these risk factors that are present, the less likely that the person can be safely treated at home. The combination of these risk factors determine a specific score or risk group, helping to guide the clinician in the decision. The results must be used along with the doctor's clinical judgment. People who have been living in a nursing home or other residential facility are of greater concern. Older people and infants, particularly infants younger than 1 month old, are more likely to be admitted. People with very few of these risks often can be discharged with outpatient care only. This determination can often be made with a simple physical examination and history. Sometimes a person needs to be hospitalized for only 24 hours for observation. People with higher scores on these assessment tests often have many risk factors and usually are hospitalized. When possible, treatment of CAP should be started within 4 hours of admission to the emergency room or hospital to reduce the chances of mortality and decrease the amount of time a person needs to spend in the hospital. Home care may be possible, even in severe cases, when there is good support and available home nursing services. Often, caregivers can even be trained to administer intravenous antibiotics and chest therapy to people at home. Drink plenty of liquids (1 to 2 quarts [0.9 to 1.9 liters] daily). Take oral temperature several times a day. Call your doctor if it does not come down with treatment. Do not suppress a cough. Coughing is an important reflex for clearing the lungs. Some doctors advise taking expectorants, such as guaifenesin (Breonesin, Glycotuss, Glytuss, Hytuss, Naldecon Senior EX, Robitussin) to loosen mucus. However, there is no proof that any of these products make much difference in a person's outcome. Mild pain can be treated with aspirin (in adults only), acetaminophen (Tylenol), or ibuprofen (Advil, Motrin). For severe pain, codeine or another stronger pain reliever may be prescribed. It should be noted, however, that codeine and other narcotics suppress coughing, so they should be used with care in pneumonia. Such pain relievers often require monitoring. Finish entire course of antibiotics. If the pneumonia is severe enough for hospitalization, the standard treatment is intravenous antibiotics for 5 to 8 days. In cases of uncomplicated pneumonia, many patients may need only 2 or 3 days of intravenous antibiotics followed by oral therapy. Antibiotics taken by mouth are prescribed when the patient has improved substantially or leaves the hospital. IDSA/ATS guidelines recommend that patients admitted to the hospital (but not the ICU) be treated with fluoroquinolones or a beta-lactam (such as cefotaxime [Claforan] or ceftriaxone [Rocephin]) plus a macrolide. Some experts believe that patients can go home when their temperature drops to 101°F (38.3°C). Stricter criteria require that it be at or close to 98.6°F (37°C). The goal is a normal breathing rate, although expert opinion differs on the degree of normality required for discharge. The goal is 100 beats per minute or less. The goal is systolic blood pressure of 90 mm Hg or greater. The doctor determines the goal. The goal is regular appetite. Patients or their families should discuss these criteria with their doctor. Chest therapy using incentive spirometry, rhythmic inhalation and coughing, and chest tapping are all important techniques to loosen the mucus and move it out of the lungs. It should be used both in the hospital and during recovery at home. The person uses an incentive spirometer at regular intervals to improve breathing and loosen sputum. The spirometer is a hand-held clear plastic device that includes a breathing tube and a container with a movable gauge. The person exhales, then inhales forcefully through the tube, using the pressure of the inhalation to raise the gauge to the highest level possible. Before starting the breathing exercise, the person should tap lightly on the chest to loosen mucus in the lung. If available, a caregiver should also tap on the person's back. The person inhales rhythmically and deeply 3 or 4 times. The person then coughs as deeply as possible with the goal of producing sputum. People who are not able to get enough oxygen into their cells and bloodstream may need oxygen therapy. It may be done in the hospital or at home under medical supervision. Delivery systems include an oxygen concentrator or more mobile cylinder option. Nasal prongs or a face mask will deliver the oxygen. Oxygen levels will be monitored regularly. Anyone using oxygen should stay away from open flames, including cigarettes. Dozens of antibiotics are available for treating pneumonia, but selecting the best drug is sometimes difficult. People with pneumonia need an antibiotic that is effective against the organism causing the disease. When the organism is unknown, "empiric therapy" is given, meaning the doctor chooses which antibiotic is likely to work based on factors such as the person's age, health, and severity of the illness. How severe is the pneumonia? People with mild-to-moderate cases take oral antibiotics at home. People with severe pneumonia usually need intravenous antibiotics in the hospital. If the organism causing the pneumonia is not known, was the disorder community- or hospital-acquired? Different organisms are usually involved in each setting. The doctor can use this information to guess the most likely organism causing the pneumonia. If the organism is known, is it typical or atypical? CAPs, for example, are usually caused by the typical bacteria S pneumoniae, H influenzae, or M catarrhalis, which were previously treated with related antibiotics. These antibiotics do not treat organisms such as legionella, mycoplasma, or chlamydia. These organisms are generally treated with a macrolide or a newer fluoroquinolone. Does the person have an impaired immune system? Antibiotics used to treat such people may differ from those used in people with healthy immune systems. Individuals respond differently to the same antibiotic, depending on their age, health, size, and other factors. People can be allergic to certain antibiotics, thus requiring alternatives. People may have strains of bacteria that are resistant to certain antibiotics. For a more detailed discussion of the different types of antibiotics, see the "Antibiotic Classes" section below. Joint guidelines issued in 2007 by the IDSA/ATS recommend that mild CAP in otherwise healthy people who have not taken antibiotics in the past 3 months be treated with an oral macrolide antibiotic (such as azithromycin, clarithromycin, or erythromycin). If the person lives in an area with high S pneumoniae resistance to macrolides alternative antibiotic therapy should be considered. The British Thoracic Society recommends amoxicillin, doxycycline, or clarithromycin as alternatives. Many people with heart disease, kidney disease, diabetes, or other coexisting conditions may still be treated as outpatients. People with coexisting conditions and those that have taken antibiotics within the past 3 months should be given a macrolide plus a beta-lactam (high-dose amoxicillin, amoxicillin/clavulanate, cefpodoxime, ceftriaxone, or cefuroxime) or a fluoroquinolone. Doxycycline can be given as an alternative to a macrolide. Those that have taken an antibiotic in the past 3 months should be treated with an antibiotic from an alternative class. If the person lives in an area with high S pneumoniae resistance to macrolides an alternative antibiotic from a different class should be given. Current recommendations call for at least 5 days of antibiotic therapy. People should have no fever for at least 48 hours and no more than one sign of continuing severe illness before discontinuing antibiotics. Many cases of CAP are caused by S pneumoniae -- Gram-positive bacteria that usually respond to antibiotics known as beta-lactams (which include penicillin), and to macrolides. However, resistant strains of S pneumoniae are increasingly common. Most resistant strains respond to fluoroquinolones such as levofloxacin (Levaquin), gemifloxacin (Factive), or moxifloxacin (Avelox). In addition, other important causes of CAP, particularly in younger people, are atypical bacteria, which respond to macrolides (clarithromycin, azithromycin, or erythromycin), or newer fluoroquinolones. In children, amoxicillin is the first line treatment in non-severe pneumonia. Macrolides may be considered for children with suspected atypical pathogens. Antiviral medications should be given to children with moderate to severe CAP with influenza infection as soon as possible. It is prudent to follow up on outpatient treatment response within 48 to 72 hours of initiating treatment. There are not as many choices for treating viral pneumonia. Oseltamivir (Tamiflu), zanamivir (Relenza), and peramivir (Rapivab) have been the recommended drugs for influenza A or B infections, but some strains of influenza A are resistant to them. Generally, the use of these drugs is only recommended if they can be started in the first 48 hours of symptoms. Taken early, these medications may be effective in reducing the severity and duration of illness. However, treatment initiated even after 48 hours may benefit children with severe disease. Intravenous immunoglobulins may be used in immunodeficient children who develop some viral pneumonias, as they have been shown to improve outcomes. People with viral pneumonias are at risk for what are called "superinfections," which generally refers to a secondary bacterial infection, usually caused by S pneumoniae, S aureus, or H influenzae. Doctors most commonly recommend treatment with amoxicillin-clavulanate, cefpodoxime, ceftriaxone, cefuroxime, or a newer fluoroquinolone if these secondary infections occur. People with pneumonia caused by varicella-zoster and herpes simplex viruses are usually admitted to the hospital and treated with intravenous acyclovir for 7 days. No antiviral drugs have been proven effective in adults with RSV, parainfluenza virus, adenovirus, metapneumovirus, the SARS coronavirus, or hantavirus. Treatment is largely supportive, with people receiving oxygen and ventilator therapy as needed. Ribavarin is the first treatment approved for RSV pneumonia, although it has only modest benefits. The American Academy of Pediatrics recommends this drug for certain children who are at high risk for serious complications of RSV. Allergic reactions (most commonly with medications derived from penicillin or sulfa). These reactions can range from mild skin rashes to rare but severe -- even life threatening -- anaphylactic shock. Infection with Clostridium difficile, the bacteria responsible for causing severe diarrhea, inflammation of the colon (colitis), and abdominal pain. This condition can be fatal. Interactions with certain drugs, including some over-the-counter (OTC) medications and supplements. People should inform their doctors of all medications and OTC preparations they are taking, as well as any drug allergies they might have. Stomach problems (most common side effect). Vaginal infections. Taking Lactobacillus acidophilus supplements or eating yogurt with active acidophilius cultures may help restore healthy bacteria that reduce the risk for such infections. There is no strong evidence that this helps prevent yeast infections. Beta-lactam antibiotics share common chemical features. They include penicillins, cephalosporins, and some newer similar medications. They interfere with bacterial cell walls. Natural penicillins include penicillin G (for intravenous use) and V (for oral use). Penicillin derivatives called aminopenicillins, particularly amoxicillin (Amoxil, Polymox, Trimox, Wymox, or any generic formulation), are now the most common penicillins used. Amoxicillin is inexpensive and, at one time, was highly effective against S pneumoniae. Unfortunately, bacterial resistance to amoxicillin has increased significantly, both among S pneumoniae and H influenzae srains. Ampicillin is similar and is an alternative to amoxicillin, but it requires more doses and has more gastrointestinal side effects. Amoxicillin-clavulanate (Augmentin) is a type of penicillin that works against a wide variety of bacteria. An extended-release (ER) form has been approved for treating adults with CAP caused by bacterial strains that have become partially resistant to penicillin. Antistaphylococcal penicillins were developed to treat S aureus. The standard drug was methicillin; it has been replaced by related drugs, but they are no longer used routinely, due to very high rates of resistance in hospital-acquired pneumonias (the appearance of the so called MRSA). Resistance in community-acquired S aureus is also increasing. Alternatives include vancomycin, linezolid, daptomycin, and ceftaroline, the first beta-lactam drug that is active against MRSA. Penicillins used against P aeruginosa include ticarcillin (Ticar) and piperacillin (Pipracil). Piperacillin is more effective than ticarcillin. Many people have a history of an allergic reaction to penicillin, however, that the allergy may not occur again in a significant number of adults. Skin tests are available to help determine if those with a history of penicillin allergies could use these important antibiotics. First generation includes cephalexin (Biocef, Keflex), cefadroxil (Duricef, Ultracef), cephradine (Velosef). Second generation includes cefaclor (Ceclor, Raniclor), cefuroxime (Ceftin), cefprozil (Cefzil). Third generation includes cefpodoxime (Vantin), cefdinir (Omnicef) cefditoren (Sprectracef), cefixime (Suprax), and ceftibuten (Cedex). Ceftriaxone (Rocephin) is an injected cephalosporin. These are effective against a wide range of Gram-negative bacteria. Ceftaroline, a cephalosporin, is the first beta-lactam active against MRSA and multidrug-resistant S pneumoniae. Carbapenems include meropenem (Merrem), ertapenem (Invanz) and combinations (imipenem/cilastatin [Primaxin]). These drugs are used to treat a wide variety of bacteria. They are now used for serious hospital-acquired infections and bacteria that have become resistant to other beta-lactams. Fluoroquinolones (quinolones) interfere with bacteria's genetic material to prevent them from reproducing. Ciprofloxacin (Cipro), a second-generation quinolone, remains the most potent quinolone against P aeruginosa. It is not very effective against Gram-positive bacteria such as S pneumoniae. Newer ("respiratory") quinolones are currently the most effective drugs available for a wide range of bacteria. Such drugs include levofloxacin (Levaquin) and gemifloxacin (Factive). Some of the newer fluoroquinolones need to be taken only once a day. The fourth-generation quinolones such as moxifloxacin (Avelox) are proving to be effective against anaerobic bacteria. S pneumoniae -- strains resistant to the "respiratory" fluoroquinolones are uncommon in the US, but resistance is dramatically increasing. Pregnant women should not take these medications. The drugs also enhance the potency of oral anti-clotting drugs. These antibiotics are effective against atypical bacteria such as mycoplasma and chlamydia. Macrolides are also used in some cases for S pneumoniae and M catarrhalis, but there is increasing bacterial resistance to these antibiotics. ER azithromycin (Zmax) is the first anti-pneumonia antibiotic that can be given in a single dose. It is effective against Gram-positive, Gram-negative, and atypical bacteria. A single-dose ER antibiotic decreases the likelihood that a person will stop taking the antibiotic early, which rapidly contributes to the development of drug-resistant bacteria. Lincosamides prevent bacteria from reproducing. The only member of this group in clinical use is clindamycin (Cleocin). This antibiotic is useful against anaerobic bacteria, S pneumoniae and S aureus, but not against H influenzae. Glycopeptides (vancomycin) are used for S aureus infections that have become resistant to standard antibiotics. The drug must be given intravenously for pneumonia and other infections beyond the intestinal tract. The newest glycopeptide, a derivative of vancomycin, is called telavancin (Vibativ). It has an indication for the treatment of hospital-acquired Gram-positive pneumonia when alternative treatments are not suitable. Trimethoprim-sulfamethoxazole (Bactrim, Cotrim, and Septra) is less expensive than many other antibiotics. It is particularly useful for adults with mild bacterial upper respiratory infections who are allergic to penicillin. The drug is no longer effective against certain streptococcal strains. It should not be used in people whose infections occur after dental work, or in people who are allergic to sulfa drugs. Allergic reactions can be very serious. Linezolid (Zyvox) is the first antibacterial drug in a new class of man-made antibiotics called oxazolidinones. It has been shown to work against certain aerobic Gram-positive bacteria. Dangerous drug interactions, however, can occur when taking this medication with other common medications, including cold medicines and certain antidepressants known as selective serotonin reuptake inhibitors (SSSRIs). Tigecycline (Tygacil) is now approved for community-acquired bacterial pneumonia. It is given intravenously and works against most gram-positive organisms including MRSA. This drug can cause tooth discoloration in young children. It is not recommended for use during pregnancy, unless no other alternative is available. In 2010 the FDA announced a safety warning that there is increased risk of death when IV Tygacil is used compared to other antibiotics. Tygacil should be used in situations when alternative treatments are not suitable. Inhaled polymyxin, a drug used in people with cystic fibrosis, is showing some effectiveness against pneumonia caused by multidrug-resistant Gram-negative bacteria, including pseudomonas and klebsiella. Corticosteroid use in people with pneumonia is also under investigation. Corticosteroids impact the immune system, carbohydrate and protein metabolism, electrolyte balance, and stress response. They may help to speed recovery and resolve symptoms, but more research is necessary to suggest recommendations for populations. Although most people with pneumonia do not need invasive therapy, it may be necessary in people with empyema or certain other complications. Removing the chest tubes may cause the lung to collapse. In this case, a chest tube may be needed to inflate the lung. Click the icon to see an image series about chest tube insertion. The best way to prevent serious respiratory infections such as pneumonia is to avoid sick people (if possible), and to practice good hygiene. Colds and flu are spread primarily from infected people who cough or sneeze. People commonly transmit a cold when they shake hands. Washing hands frequently can prevent the spread of viral respiratory illnesses. Always wash your hands before eating and after going outside. Using ordinary soap is sufficient. Alcohol-based gels are also effective for everyday use, and may even kill cold viruses. If extreme hygiene is required, use alcohol-based rinses. Antibacterial soaps add little protection, particularly against viruses. Wiping surfaces with a solution that contains 1 part bleach to 10 parts water is very effective at killing viruses. Bacteria abound in hospitals and long-term care facilities. They are particularly able to cause disease in areas with the sickest patients, such as ICUs. Health care facilities are changing many of their practices and educating doctors, nurses, and therapists about reducing the likelihood of transmitting bacteria. Injected vaccines against the flu ("flu shots") use inactivated (not live) viruses. The nasal spray influenza vaccine uses an attenuated (greatly weakened) live flu virus. Flu vaccines are designed to provoke the immune system to attack antigens contained on the surface of the virus. Antigens are foreign molecules that the immune system recognizes and targets for attack. Each year, scientists decide which viruses are likely to circulate during the upcoming flu season and make recommendations for updated seasonal vaccines. Ideally, people should get a flu shot every October or November. However, it may take longer for a full supply of the vaccine to reach certain locations. In such cases, high-risk groups should get vaccinated first. The US Centers for Disease Control and Prevention (CDC) Advisory Council recommends that, unless contraindicated, all people ages 6 months and older, unless contraindicated, get a flu shot every year. These universal recommendations simplify earlier recommendations for specific high-risk groups. Older children and adults need only a single shot each year. However, children under age 9 years may need 2 shots, given 1 month apart the first time they receive the flu vaccine or if they have not previously received two doses during a flu season. Some people have a higher risk of the disease. 23-valent polysaccharide vaccine (Pneumovax) for all adults over 65 years, children over 2 with weakened immune systems and adults ages 19 to 64 years who smoke or have asthma. 13-valent conjugate vaccine (Prevnar or PCV13) for infants and children under 5 years of age; also for adults (age 19 years and older) with certain risk factors including nonworking spleen, weakened immune system, or cochlear (inner ear) implants. Experts are now recommending that more people, including healthy older people, receive the pneumococcal vaccine, particularly in light of the increase in antibiotic-resistant bacteria. The Food and Drug Administration (FDA) has approved the pneumococcal conjugate vaccine (Prevnar 13 or PCV13) for children 6 weeks to 17 years old for the prevention of pneumococcal pneumonia. PCV13 covers 13 types of pneumococci and replaces an earlier version, PCV 7. Children age 2 years or older who have medical conditions that increase the risk of pneumococcal pneumonia should also receive the pneumococcal polysaccharide vaccine PPSV23 at least 8 weeks after completing PCV 13 immunization. Many experts now recommend the PCV 13 for all children up to age 5, and older children with certain medical conditions. Healthy children who received the PCV 7 vaccine will complete their scheduled doses with the newer PCV 13. The pneumococcal conjugate vaccine has now been added to the Recommended Childhood Immunization Schedule. Studies are suggesting that it prevents common ear infections, as well as pneumonia in children. The recommended schedule of immunization for PCV13 in healthy children includes 4 doses, given at 2, 4, 6, and 12 to 15 months of age. It is recommended that immune-compromised children be revaccinated at certain intervals. In healthy adults age 65 years and older who have not previously received a pneumococcal vaccine, the Advisory Committee on Immunization Practices (ACIP) now recommends sequential administration of PCV 13 and the pneumococcal polysaccharide vaccine PPSV23 one year or more following the PCV 13 vaccine. In adults who have previously received a PPSV23 vaccine, a single dose of PCV 13 should be given one year or more after the PPSV23. The ACIP recommends adults ages 19 to 64 years who have heavy alcohol use, tobacco use, or have medical conditions including diabetes, heart, lung, or liver disease receive pneumococcal polysaccharide vaccine PPSV23. Sequential administration of PCV 13 and PPSV23 is recommended in adults age 18 years or older who have any of the following medical issues: splenectomy or a condition affecting spleen function, an immunocompromised condition; a cerebrospinal fluid leak, or a cochlear implant. Adults with these medical issues should receive the PPSV23 vaccine 8 weeks or more following the PCV 13 vaccine. Revaccination schedules vary depending upon age and medical condition. Insist that others wash their hands with warm water and soap before touching your baby. Have others avoid contact with the baby if they have a cold or fever. It may be helpful for them to wear a mask. Be aware that kissing the baby can spread RSV infection. Try to keep young children away from your baby. RSV is very common among young children, and easily spreads from child to child. Do not smoke inside your house, car, or anywhere near your baby. Exposure to tobacco smoke increases the risk of RSV illness. Have children above 6 months of age and all household members immunized against influenza. Palivizumab (Synagis) is a monoclonal antibody, a genetically engineered antibody that targets the RSV virus. It is given by an injection into the muscle. RSV immune globulin (RespiGam) is made up of antibodies to RSV that are taken from the blood of healthy infants. RespiGam is given as a shot. The H influenzae type B (Hib) vaccine is available as one of the routine childhood immunizations, typically given at 2, 4, and 12 months. This vaccine can be given by itself or together with other vaccines (DTaP-Hib-IPV or HepB-Hib). In addition to children up to the age of 5 years, the Hib vaccine is also recommended for adults with certain health problems, such as sickle cell disease, or conditions affecting the spleen, or for recipients of hematopoietic stem cell transplants. The chickenpox virus rarely causes complications in healthy children, but may be responsible for pneumonia in people with compromised immune systems. The chickenpox (varicella) vaccine (called VAR) is a routine vaccine recommended for children through 6 years old. In addition, people age 13 years and older who did not have chickenpox and have not been previously vaccinated should receive the VAR vaccine, particularly those at high risk of exposure, women of childbearing age, and international travelers. American Academy of Pediatrics Committee on Infectious Diseases, American Academy of Pediatrics Bronchiolitis Guidelines Committee. Updated guidance for palivizumab prophylaxis among infants and young children at increased risk of hospitalization for respiratory syncytial virus infection. Pediatrics. 2014;134(2):415-420. PMID: 25070315 www.ncbi.nlm.nih.gov/pubmed/25070315. Alimi Y, Lim WS, Lansbury L, Leonardi-Bee J, Nguyen-Van-Tam JS. Systematic review of respiratory viral pathogens identified in adults with community-acquired pneumonia in Europe. J Clin Virol. 2017;95:26-35. PMID: 28837859 www.ncbi.nlm.nih.gov/pubmed/28837859. Bradley JS, Byington CL, Shah SS, et al. Executive summary: the management of community-acquired pneumonia in infants and children older than 3 months of age: clinical practice guidelines by the Pediatric Infectious Diseases Society and the Infectious Diseases Society of America. Clin Infect Dis. 2011;53(7):617-630. PMID: 21890766 www.ncbi.nlm.nih.gov/pubmed/21890766. Center for Disease Control and Prevention website. Pneumococcal disease. www.cdc.gov/pneumococcal/index.html. Updated September 6, 2017. Accessed June 15, 2018. Chen Y, Li K, Pu H, Wu T. Corticosteroids for pneumonia. Cochrane Database Syst Rev. 2011;(3):CD007720. PMID: 21412908 www.ncbi.nlm.nih.gov/pubmed/21412908. Franquet T. Pulmonary infection in adults. In: Adam A, Dixon AK, Gillard JH, Schaefer-Prokop CM, eds. Grainger & Allison's Diagnostic Radiology. 6th ed. Philadelphia, PA: Elsevier Churchill Livingstone; 2015:chap 12. Holzman RS, Simberkoff MS. Mycoplasma pneumoniae and atypical pneumonia. In: Bennett JE, Dolin R, Blaser MJ, eds. Mandell, Douglas, and Bennett's Principles and Practice of Infectious Diseases. 8th ed. Philadelphia, PA: Elsevier Saunders; 2015:chap 185. Kaysin A, Viera AJ. Community-acquired pneumonia in adults: diagnosis and management. Am Fam Physician. 2016;94(9):698-706. PMID: 27929242 www.ncbi.nlm.nih.gov/pubmed/27929242. Kim DK, Bridges CB, Harriman KH. Advisory Committee on Immunization Practices recommended immunization schedule for adults aged 19 years or older: United States, 2015. MMWR Morb Mortal Wkly Rep. 2015;64(4):91-92. PMID: 25654609 www.ncbi.nlm.nih.gov/pubmed/25654609. Lodha R, Kabra SK, Pandey RM. Antibiotics for community-acquired pneumonia in children. Cochrane Database Syst Rev. 2013;(6):CD004874. PMID: 23733365 www.ncbi.nlm.nih.gov/pubmed/23733365. Mandell LA, Wunderink RG, Anzueto A, et al. Infectious Diseases Society of America/American Thoracic Society consensus guidelines on the management of community-acquired pneumonia in adults. Clin Infect Dis. 2007;44 Suppl 2:S27-S72. PMID: 17278083 www.ncbi.nlm.nih.gov/pubmed/17278083. Moran GJ, Rothman RE, Volturo GA. Emergency management of community-acquired bacterial pneumonia: what is new since the 2007 Infectious Diseases Society of America/American Thoracic Society guidelines. Am J Emerg Med. 2013;31(3):602-612. PMID: 23380120 www.ncbi.nlm.nih.gov/pubmed/23380120. Moran GJ, Talan DA. Pneumonia. In: Marx JA, Hockberger RS, Walls RM, eds. Rosen's Emergency Medicine Concepts and Clinical Practice. 8th ed. Philadelphia, PA: Elsevier Saunders; 2014:chap 76. Musher DM. Overview of pneumonia. In: Goldman L, Schafer AI. eds. Goldman-Cecil Medicine. 25th ed. Philadelphia, PA: Elsevier Saunders; 2016:chap 97. Pappas PG. Chronic pneumonia. In: Bennett JE, Dolin R, Blaser MJ, eds. Mandell, Douglas, and Bennett's Principles and Practice of Infectious Diseases. 8th ed. Philadelphia, PA: Elsevier Saunders; 2015:chap 72. Prina E, Ranzani OT, Torres A. Community-acquired pneumonia. Lancet. 2015;386(9998):1097-1108. PMID: 26277247 www.ncbi.nlm.nih.gov/pubmed/26277247. Strikas RA; Centers for Disease Control and Prevention (CDC); Advisory Committee on Immunization Practices (ACIP); ACIP Child/Adolescent Immunization Work Group. Advisory Committee on Immunization Practices recommended immunization schedules for persons aged 0 through 18 years - United States, 2015. MMWR Morb Mortal Wkly Rep. 2015;64(4):93-94. PMID: 25654610 www.ncbi.nlm.nih.gov/pubmed/25654610. Tomczyk S, Bennett NM, Stoecker C, et al. Use of 13-valent pneumococcal conjugate vaccine and 23-valent pneumococcal polysaccharide vaccine among adults aged =65 years: recommendations of the Advisory Committee on Immunization Practices (ACIP). MMWR Morb Mortal Wkly Rep. 2014;63(37):822-825. PMID: 25233284 www.ncbi.nlm.nih.gov/pubmed/25233284.